AROUND A.D. 112, Pliny, the Roman governor of Bithynia (a province in northwest Turkey), wrote to the emperor Trajan in Rome. Pliny needed guidance on the persecution of Christians, and he reported what his investigations had disclosed. [The Christians] maintained that the amount of their fault or error had been this, that it was their habit on a fixed day to assemble before daylight and recite by turns a form of words to Christ as a god; and that they bound themselves with an oath, not for any crime, but not to commit theft or robbery or adultery, not to break their word, and not to deny a deposit when demanded. After this was done, their custom was to depart, and to meet again to take food, but ordinary and harmless food. 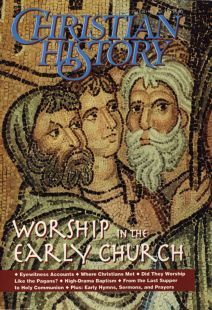 The Didache (Greek for teaching) is our earliest example of a “church order. ” It sets out how congregations should baptize, fast, pray, receive visiting prophets, and the like. The Didache probably reached its present form before the end of the first century A.D., but it certainly contains earlier material. Interpretations of the first account below differ widely. Does it describe the Lord’s Supper—since it makes no mention of the Last Supper or the cross? Is it the agape, the early Christians’ love feast or church supper? Or the Lord’s Supper combined with the agape? We thank you, our Father, for the holy vine of your servant David, which you made known to us through your servant Jesus. Glory be to you forever. We thank you, our Father, for the life and knowledge which you made known to us through your servant Jesus. Glory be to you for ever. As this broken bread was scattered over the hills and was brought together and became one, so may your church be brought together from the ends of your earth into your kingdom, for yours is the glory and power through Jesus Christ forever. We thank you, holy Father, for your holy name which you have given to dwell in our hearts, and for the knowledge and faith and immortality which you made known to us through your servant Jesus. Glory be to you forever. You, Almighty Sovereign, have created everything for your name’s sake, you have given food and drink to men and women for their enjoyment that they might give you thanks, but on us you have bestowed spiritual food and drink and eternal life through your servant. Above all else we thank you that you are mighty. Glory be to you forever. Remember, Lord, your church, to deliver it from all evil and to make it perfect in your love, and bring it together from the four winds, sanctified for your kingdom, which you have prepared for it. Yours is the power and glory forever. Whoever is holy, let him come; whoever is not, let him repent. Maranatha [Our Lord, come!]. Amen. But allow prophets to give thanks as much as they please. On the Lord’s own day come together and break bread and give thanks, after first confessing your sins, so that your sacrifice may be pure. Tertullian was a powerful thinker and writer of the early third century in Carthage (near Tunis today). At some point, Tertullian embraced the Montanist movement, a prophetic movement that made special claims about the Holy Spirit. In this selection, from The Soul, Tertullian gives a rare glimpse of charismatic experience in worship. Since we acknowledge spiritual charismata, or gifts, we too have merited the attainment of the prophetic gift, although coming after John [the Baptist]. We have now among us a sister whose lot it has been to be favored with sundry gifts of revelation, which she experiences in the Spirit by ecstatic vision during the sacred rites of the Lord’s day in the church: she converses with angels, and sometimes even with the Lord; she both sees and hears mysterious signs; some hearts she understands; and to those in need she distributes remedies. Whether in the reading of the Scriptures, or in the chanting of psalms, or in the preaching of sermons, or in the offering up of prayers, in all these religious services matter and opportunity are afforded her of seeing visions. . . . After the people are dismissed at the conclusion of the sacred services, she is in the regular habit of reporting to us whatever she may have seen in vision (for all her communications are examined with the most scrupulous care, in order that their truth may be probed). “Among other things, ” says she, “there has been shown to me a soul in bodily shape, and a spirit has been in the habit of appearing to me; not, however, a void and empty illusion, but such as would offer itself to be grasped by the hand, soft and transparent and of an ethereal color, and in form resembling that of a human being in every respect. ” This was her vision, and for her witness there was God; and the apostle most assuredly foretold that there were to be spiritual gifts in the church. Hippolytus, who died as a martyr around A.D. 236, was a prominent but controversial figure in the church at Rome. His Apostolic Tradition, written c. 215, is a church order, much more developed than the Didache. The Apostolic Tradition’s directions for the Eucharist are interspersed with services of ordination and baptism. And all shall say: And with your spirit. We have them with the Lord. Let us give thanks to the Lord. It is fitting and right. And then he shall continue; thus: We render thanks to you, O God, through your beloved child Jesus Christ, whom in the last times you sent to us as savior and redeemer and angel of your will; who is your inseparable Word, through whom you made all things, and in whom you were well pleased. You sent him from heaven into the Virgin’s womb; and conceived in the womb, he was made flesh and was manifested as your Son, being born of the Holy Spirit and the Virgin. Fulfilling your will and gaining for you a holy people, he stretched out his hands when he should suffer, that he might release from suffering those who have believed in you. Remembering therefore his death and resurrection, we offer to you the bread and the cup, giving you thanks because you have held us worthy to stand before you and minister to you. And we ask that you would send your Holy Spirit upon the offering of your holy church; that gathering them into one, you would grant to all who partake of the holy things (to partake) for the fullness of the Holy Spirit for the strengthening of faith in truth; and that we may praise and glorify you through your child Jesus Christ, through whom be glory and honor to you, with the Holy Spirit, in your holy church, both now and to the ages of ages. Amen. And when he breaks the bread, in distributing fragments to each, he shall say: The bread of heaven in Christ Jesus. And he who receives shall answer: Amen. And if there are not enough presbyters, the deacons also shall hold the cups, and stand by in good order and reverence: first, he who holds the water; second, the milk; third, the wine. And they who receive shall taste of each thrice, he who gives it saying: In God the Father Almighty. And he who receives shall say: Amen. And in the Lord Jesus Christ. Amen. So shall it be done with each one. When these things have been done, each one shall hasten to do good works and to please God and to conduct himself rightly, being zealous for the church, doing what he has learned and advancing in piety. Hippolytus also gives instructions for a weekday morning service. Let every faithful man and woman, when they have risen from sleep in the morning, before they touch any work at all, wash their hands and pray to God, and so go to their work. But if instruction in the Word of God is given, each one should choose to go to that place, reckoning in his heart that it is God whom he hears in the instructor. For he who prays in the church will be able to pass by the wickedness of the day. He who is pious should think it a great evil if he does not go to the place where instruction is given and especially if he can read, or if a teacher comes. Let none of you be late in the church, the place where teaching is given. Then it shall be given to the speaker to say what is useful to each one; you will hear things which you do not think of, and profit from things which the Holy Spirit will give you through the instructor. In this way your faith will be strengthened about the things you will have heard. You will also be told in that place what you ought to do at home. Therefore let each one be diligent in coming to the church, the place where the Holy Spirit flourishes. If there is a day when there is no instruction, let each one, when he is at home, take up a holy book and read in it sufficiently what seems to him to bring profit. Cyprian, a prominent bishop of Carthage (near modern Tunis), wrote this stern warning to a fellow bishop c. 255. In offering the cup, the tradition of the Lord must be observed, and we must do nothing but what the Lord first did on our behalf: the cup which is offered in remembrance of him must be offered mixed with wine. Hence it is evident that the blood of Christ is not offered if there is no wine in the cup, nor is the Lord’s sacrifice celebrated with a proper consecration unless our offering and sacrifice correspond to his passion. . . . Some may be nervous in our morning sacrifices, lest by tasting wine their breath may smell of the blood of Christ. This is how the brethren are beginning to hold back even from sharing Christ’s passion in persecution, by learning in the offerings to be embarrassed at his blood and bloodshedding. . . . How can we shed our blood for Christ if we blush for shame to drink Christ’s own blood? After this we make mention of heaven and earth and sea, of sun and moon, of the stars and all creation, rational and irrational, visible and invisible, of angels, archangels, powers, dominions, principalities, authorities, and thrones, of the many-faced cherubim—in effect repeating David’s call to “Magnify the Lord with me. ” We mention also the seraphim, whom Isaiah in the Holy Spirit saw encircling God’s throne . . . who cried: “Holy, holy, holy, Lord God of hosts. ” The reason why we rehearse this confession of God, delivered to us from the seraphim, is that we may join the hosts of the world above in their hymnody. Then after sanctifying ourselves by these spiritual hymns, we call upon the merciful God to send forth his Holy Spirit upon the gifts lying before him, that he may make the bread the body of Christ and the wine the blood of Christ; for whatever the Holy Spirit has touched is surely sanctified and changed. Then after the completion of the spiritual sacrifice, the bloodless service, over that sacrifice of propitiation, we call upon God for the common peace of the church, for the well-being of the world.... In a word, for all who stand in need of succor, we all pray and offer this sacrifice. Then we commemorate also those who have fallen asleep before us, first, patriarchs, prophets, apostles, martyrs . . . believing that it will be a very great advantage to the souls for whom supplication is offered while that holy and most awesome sacrifice lies before us. . . .
After this you hear the chanter inviting you with a sacred melody to communion in the holy mysteries, and saying: “Taste and see that the Lord is good. ” Trust not the judgment of your bodily palate, but of faith unfaltering, for when we taste we are bidden to taste, not bread and wine, but the antitype of Christ’s body and blood. . . . Then wait for the prayer, and give thanks to God who has accounted you worthy of such great mysteries. David F. Wright is dean of the faculty of divinity at the University of Edinburgh and a member of the editorial advisory board of Christian History. A look at one year of Whitefield’s whirlwind ministry. In the new religious orders, Christians blended poverty, chastity, and military fervor. What Puritans did to grow spiritually.